“Aw, phooey,” he said, as he handed me the shovel and turned to go back inside. “Aw, hell,” he said, as he hung up his coat and turned toward his walker. We are in the midst of a major snowstorm. The Weather Channel said something about 48″ around Cooperstown. I believe it. 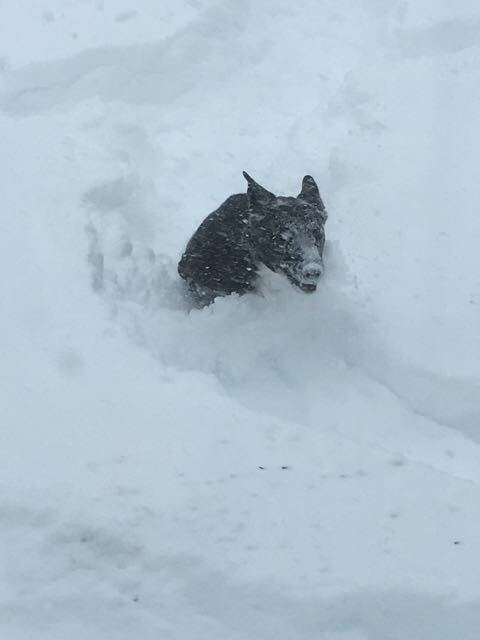 Even the dog doesn’t like it — and our dog loves snow. Maggie can’t play in this. All she can do is flounder. Last night and this morning Laurel and I shoveled for a while and barely got past one car. Then my brother, Peter, came down to borrow the car because he needed to go into town. His driveway is much longer than ours, and the plow guy hadn’t come yet. So Peter walked over and together we shoveled. We finally had a path wide enough to back the car out. I ran into the house to get Peter some money so he could pick up a prescription for my father. Just inside the door stood my father, coat on, gloves on, ready to head outside. “Where are you going, Dad?” I asked. “Well, I’m going outside to help,” he said. “I think we’re all set,” I told him. “Do you know how much work it took to get all this stuff on?” he asked, and headed for the door. I sighed, and ran to find my wallet. It wasn’t worth arguing about, and he might like to see all the snow. When I came back out, Peter was talking to my father on the ramp leading to the house. 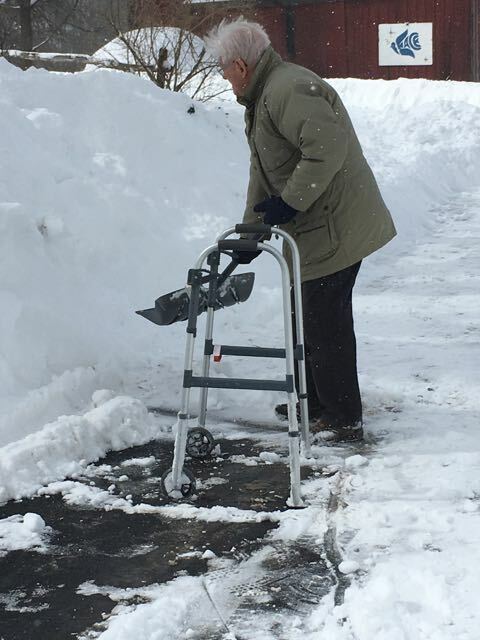 Laurel and I had barely shoveled a path wide enough for the walker to fit. I gave Peter the money and he left. “I want to go get that shovel,” he said, pointing to the shovel I had shoved into the snowbank. “I can get it,” I told him, but he pretended not to hear me and headed down the ramp. When he reached the shovel, I was right behind him. “Let me take that back to the house for you,” I said, reaching for the shovel. 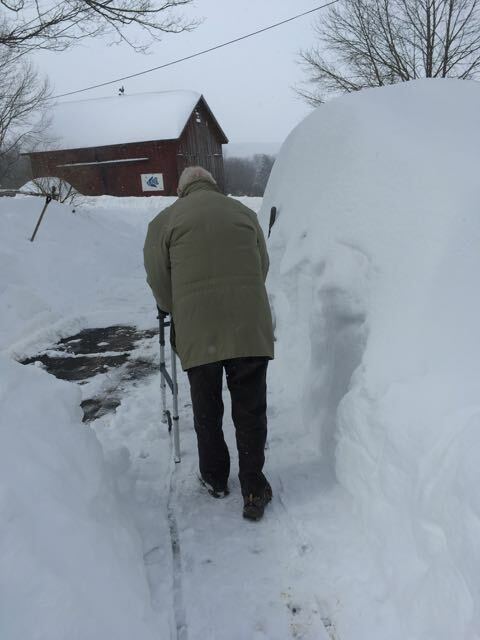 “I’d like to shovel,” he said. I groaned. He started shoveling. Inside I was feeling frustrated. He stopped and looked at me. “I’m not helpless,” he said. I walked back to the house and stood there. Why can’t he just stop? I muttered in my heart. I touched Tuga was in my pocket. Go help him, Tuga seemed to whisper. I grabbed another shovel and went back down to where my father was shuffling snow. He leaned on his shovel when I got there. “Maybe you’re right,” he said, and handed his shovel to me. “Aw, phooey,” he said, and I felt a little sad. “Aw, hell,” he said when we got inside, and my heart broke a little more. His instinct was to help, and I had just told him that he couldn’t. It’s hard to let go of doing that, even when you know you can’t do it anymore. This made my eyes water up a bit. As I was reading, I saw my mom and dad. Wow, that’s a lot of snow. Touching exchange with your father. A good reminder to those of us not physically limited to appreciate the ability we have to engage even in chores we dread.